Carnegie: Magic Detective: HOUDINI Is EVERYWHERE! The History Channel has delved into the world of Houdini before. In fact, the last time they did it was via the Sid Radner Houdini Auction. They produced a special called Houdini-Unlocking the Mystery. This was hosted by magician Lance Burton and was a fun look at the world of Houdini through the historical artifacts that were being auctioned off. 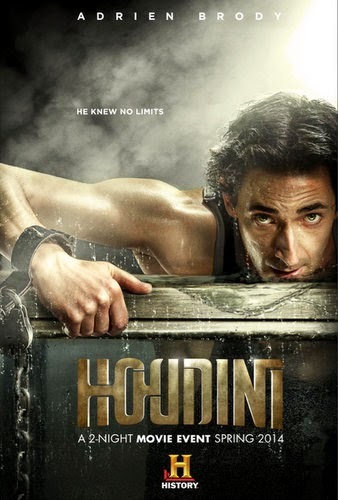 The last time Houdini was featured on TV in a movie was via the TNT produced movie HOUDINI starring Jonathan Schaech. This movie first came out in 1998 and was a mixture of truth and fiction. I suppose this is not unlike Houdini's actual life which was a mix of truth and fiction orchestrated by Houdini himself. This movie was finally released on DVD in 2013. As far as theatrical release, Houdini's last appearance on the big screen (and it was VERY short lived) was Houdini's Death Defying Acts starring Guy Pierce and Catherine Zeta-Jones. Frankly, I didn't care for this movie at all. Apparently, that was the case with theatre goers as well because it barely made a splash in the cinemas and basically went straight to DVD after a very short release. There have been countless documentaries on Houdini, but not all are available. One that is however, is from PBS called American Experience: Houdini. This is hosted by David McCullough and features interviews with prominent modern day magicians as well as rare footage of Houdini. It's an hour long and a very decent biographical documentary. The Granddaddy of Houdini movies, HOUDINI starring Tony Curtis & Janet Leigh, is thankfully still available. This movie started the careers of countless modern day magicians, myself included. It's a mix of fiction and truth, but it's a lot of fun. Finally, if you'd like to check out Houdini the movie star, yes, he made movies. 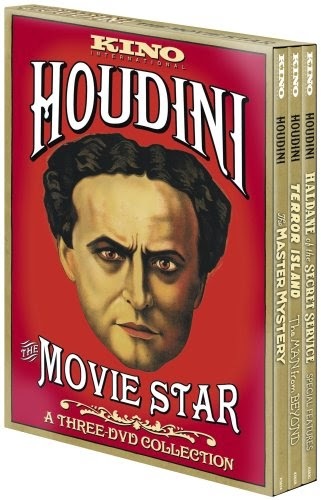 You can get the Kino box set called Houdini-The Movie Star, which is a three box set featuring Haldane of the Secret Service, Terror Island, The Man From Beyond, and The Master Mystery as well as some special features. The one movie I'm dying to see, and we might never ever see is The Grim Game. This movie is not available on DVD, VHS or anything. The only known copy, which was in a private collection, is not being released for reasons unknown. Now for an honorable mention. If you'd like to see a movie with Houdini in it as one of the characters, then you want to check out Fairy Tale-A True Story. Harvey Keitel plays Houdini and his portrayal is pretty much spot on. The movie is loosely based on something that really happened, but the producers have actually taken the true story and fictionalized it, which makes the title of the movie kind of ironic. Still, it's a fun movie and very well done. 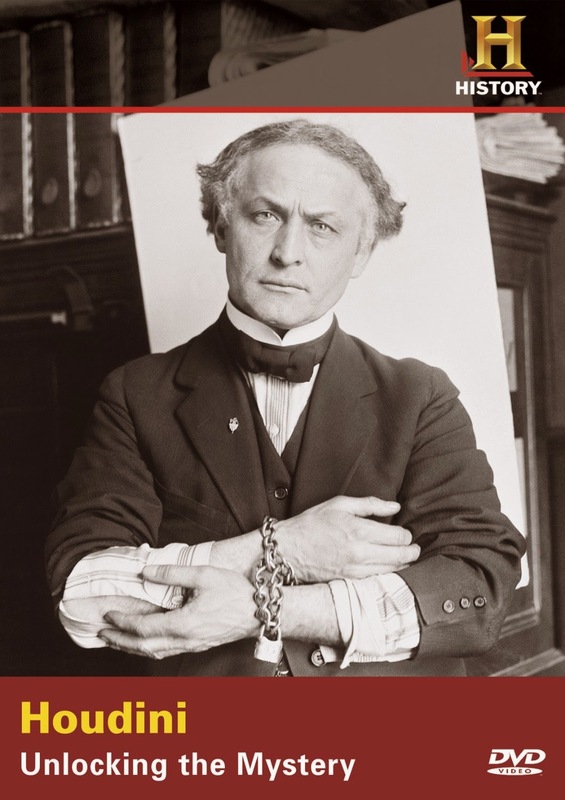 If you're new to Houdini, you would be stunned at the number of books that have been written about him. Most are out of print and yet many are still available on eBay and used book stores. Here are a three selections to get you started. If you are a magician and you really want to find out more about Houdini, one of the best books written on his magic and escapes is Houdini-The Key by Patrick Culliton. This is not a book for the novice or just the curious. This is a book for the serious Houdini researcher. There are a few of these books still available so get them while you can. There you go, now if you want to find out more about Houdini, you can look online, in books, and through videos to learn more about him. OH Wait, there is a bonus....The Adrian Brody HOUDINI Movie that will be on the History Channel Sept 1-2 will be coming out on DVD and BlueRay on October 7th, and Amazon is now taking pre-orders!